To ask other readers questions about The Little Prince, please sign up. For what age is this most suitable? Jorge That's a hard question to answer. Technically, this book is suitable for children as young as 6 years old but I doubt that most would completely…moreThat's a hard question to answer. Technically, this book is suitable for children as young as 6 years old but I doubt that most would completely understand it at that age. One of my professors once told me that this book should be read 3 times in one's life: as a child, as a young adult and as an older adult. I think he said so because as we grow older our perspective changes, and thus we become able to appreciate things in different ways. Many reviewers say this book has deep meanings, but not one person has indicated what those deep meanings are. What do you think the author was trying to tell the reader? Back then, I decided to read the author's biography instead as a distraction from the thoughts that were trying to be a bit more grown-up than my heart cared for - I was the odd kid of a literature teacher mother, after all - just to learn that just after writing this book, Antoine de Saint Exupery died when flying his plane in a war to liberate his country, killed by adults who played a game of war, too dangerous and cruel. And that finally made me cry. The next asteroid the Little Prince came to was inhabited by a Quiz Addict. He sat hunched in front of his laptop, and barely looked up when the Little Prince greeted him. There was nowhere else to sit, since the whole asteroid was covered in books. "Good morning!" said the Little Prince. "I'm sorry, I don't have time to talk to you," said the Quiz Addict. "I am very busy. Wait. In Twilight, what color was Edward's car?" "I don't know," said the Little Prince. "I have never read this book Twilight. The next asteroid the Little Prince came to was inhabited by a Quiz Addict. He sat hunched in front of his laptop, and barely looked up when the Little Prince greeted him. There was nowhere else to sit, since the whole asteroid was covered in books. "I don't know," said the Little Prince. "I have never read this book Twilight." "I think it was blue," said the man. "Damn! I was wrong. Silver. In Twilight, who joined the Cullen family first?" "I told you," said the Little Prince, "that I haven't read this book. But it must be an interesting book if you answer questions about it all day long. I would very much like to read it." "It is the stupidest book ever written!" said the man. "Then why do you answer questions about it all day long?" asked the Little Prince. "Because if I don't," sighed the man, "then my friend on asteroid B451 will get ahead of me. "He has read the whole series. Luckily, he hasn't read Harry Potter and the Deathly Hallows." "When you have finished the Quiz," asked the Little Prince, "I hope you will be able to read some of these books you have around you? I notice that you have had Atonement on your to-read list for the last six months." "It is a Never-Ending Quiz," answered the man. "In Twilight, what color was Edward's car?" "I believe you said silver?" answered the Little Prince politely. "Thank you," muttered the man. "Yes! You were right. I should have known that." "I'm sorry, I must be going," said the Little Prince. And he went on his way, thinking that grown-ups were very, very, very strange. Cassio Queiros Wonderful book. And amazing and beautiful review. Congratulations, Erin. The Little Prince (French: Le Petit Prince), first published in 1943, is a novella, the most famous work of French aristocrat, writer, poet, and pioneering aviator Antoine de Saint-Exupéry. 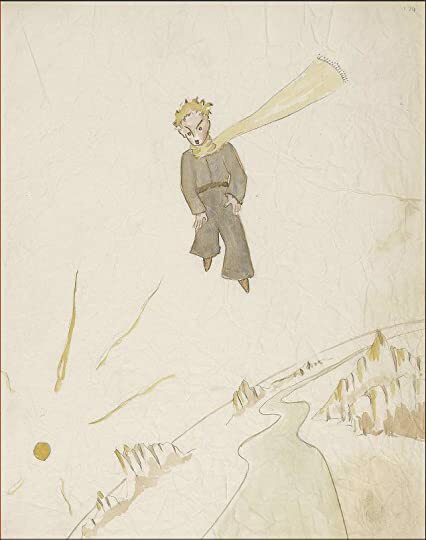 The Little Prince is a poetic tale, with watercolour illustrations by the author, in which a pilot stranded in the desert meets a young prince visiting Earth from a tiny asteroid. The story is philosophical and includes social criticism of the adult world. It was written during a period when Saint-Exupéry fled to North America subsequent to the Fall of France during the Second World War, witnessed first hand by the author and captured in his memoir Flight to Arras. The adult fable, according to one review, is actually "...an allegory of Saint-Exupéry's own life—his search for childhood certainties and interior peace, his mysticism, his belief in human courage and brotherhood, and his deep love for his wife Consuelo but also an allusion to the tortured nature of their relationship." Great observations, but personally I think it's overrated. It practically begs the reader to come to the conclusion that if you don't "get it" it's your own fault because you're a "grown up, and only kids can see what matters." It's heavy handed, clumsily executed observations on what's important in life. It's not wrong by any means, but it's kind of pseudo-intellectualist. A man crashes his plane in the de Great observations, but personally I think it's overrated. It practically begs the reader to come to the conclusion that if you don't "get it" it's your own fault because you're a "grown up, and only kids can see what matters." It's heavy handed, clumsily executed observations on what's important in life. It's not wrong by any means, but it's kind of pseudo-intellectualist. A man crashes his plane in the desert, hallucinates a small alien boy that teaches him philosophical lessons, invents a history for him, finds a well just in time to stave off dehydration, as he re-hydrates, his hallucinated alien friend kills himself and disappears, he fixes his plane and flies home and is sad about it, but feels blessed for the experience as it has changed him. "It is the time you have wasted for your rose that makes your rose so important." Or in other words, spend your time developing relationships, don't worry so much about the things, they're not important, it's the time you spend and how you spend it that is. sometimes i fall into a mood where i am simply tired of life. where i just want to crawl under the duvet with a cup of tea, hug a book and never let go. 'the little prince' is that book for me. its a truly special treasure. its precious. its my rose. parfois, je deviens fatigué de la vie. et je veux ramper sous la couette avec une tasse de thé, embrasser un livre et ne jamais lâcher. «le petit prince» est ce livre pour moi. c'est un trésor spécial. c'est précieux. c'est ma rose. The Little Prince (French: Le Petit Prince), first published in April 1943, is a novella, the most famous work of French aristocrat, writer, poet, and pioneering aviator Antoine de Saint-Exupéry. This was a toughy for me to review. I wasn't sure of the best perspective from which to provide comments so as to be of assistance to my fellow readers since this is a children's book (rather than YA which would be reviewed purely on its own merits). After a short session of "what should I do," I bravely decided to punt, figuring that there are already more than enough excellent reviews of this without my clogging up the cyber arteries with another one. Therefore, I decided simply to share my experience of reading/listening to the book with my daughter along with a couple of thoughts on the concepts discussed in the story and hope that you can take something useful from it. So as part of our nightly routine, my youngest daughter, Sydney, and I have daddy/princess read time. The other night, she and I listened to the audio version of The Little Prince while we read along with a copy of the book. As usual, it was an AMAZING experience. I am convinced that I learn more about the stories we read from her and her reactions to the narrative than she does from me...and I love it. It's only a two hour audio (86 pages) and yet the two of us spent close to 4 hours listening and talking about the various chapters in the story (plus a brief 15 minute break for Mom to give her a bath while Dad helped big sister Kenzie with her math homework). Sydney had all kinds of questions (some just hysterically funny in how much sense they made from a kid-centric view of the world). We would stop the story after each planet or character to talk about what she thought the story meant and what messages the story was trying to deliver. For those of you with children, you know how wonderful this can be and I was on the ninth cloud watching my little girl ponder over the book. From this perspective, the story was perfect and deserves an easy 5 stars. However, since it's not very helpful to rate a book based on that kind of non-transferable experience, I didn't want to rely solely on that for its final rating. After explaining to Syd the goodreads star system, she would give this 4 stars as she really liked the British accent of the narrator and the crazy adventures the Prince experiences on the various planets. BTW, from Sydney's point of view, 4 stars is the absolute ceiling for any book dealing with ickies like boys and this would easily earn 5 stars had the story been called the "The Little Princess." Princes are still second class citizens at this stage in her life...and Dad is oh, oh, OH so perfectly fine with that). For me, looking at this sans Sydney, I liked it but was not smitten with it enough to go higher than 3 stars. The story is well written and has something to say about the human condition and how people spend too much of their lives focusing on the wrong things and not enough time enjoying where they are. A nice message and one I was happy to expose Sydney to, but I was not always enamored with the path the author took to get there. Overall, a good read on its own and a potentially a great experience if shared with your children...as most things in life are. This is a beautiful tale of childhood, love and friendship. One that I wouldn't have wanted to miss. This month, three plotlines in my life collided. I know Swedish and Norwegian well, and I'd thought vaguely from time to time that I'd like to learn Icelandic too; I've always been a great admirer of Tolkien, and I knew he had been interested in Icelandic; and I have a couple of Icelandic friends. But none of this had ever come to anything. Last week, however, Jupiter aligned with Mars and I entered the Age of Aquarius. I'd just finished reading Tolkien: Maker of Middle-Earth , which has many striking passages in Icelandic, Old Norse and Old English, and our friend K happened to be on Iceland. Fired with enthusiasm by Tolkien's love of these obscure but wonderfully poetic languages, I asked K if she could possibly get me one or two Icelandic children's books. I just don't know how to thank her: she turned up with not one or two but half a dozen books, including my favorite, Le petit prince. I spent the next few days carrying it with me everywhere, snatching all opportunities to try to make sense out of it. For people who don't know anything about Icelandic, it has the same ancestor as Swedish, Danish and Norwegian. A thousand years ago they were the same language. But the mainland languages have evolved at a normal rate, while Icelandic, on its faraway island, has changed relatively little; so if you speak Swedish or Norwegian, it's like trying to read a language which for an English-speaker would be somewhere between Chaucer and Beowulf. You recognise a few of the words at once, others are more or less mangled, and still others are completely unfamiliar. The first impression is that it makes no sense at all. But I know Le petit prince, and I started trying to guess what word was what, just reading without looking anything up. 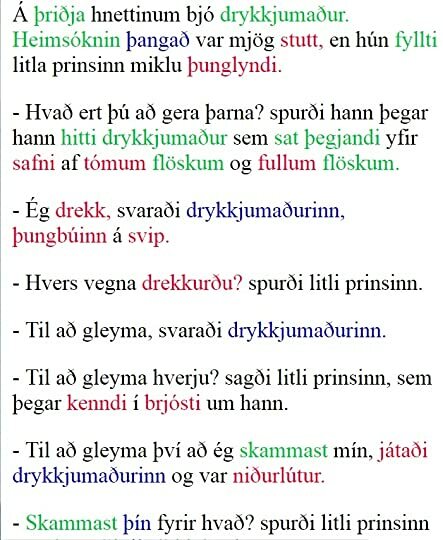 Þar sem ég hafði adrei teiknað kind dró ég upp fyrir hann aðra af þeim tveimur myndum sem ég var fær að gera: myndina af kyrkislöngunni utanverði. Då som jag hadde aldrig tecknad får drog jag upp för honom den-andra av dem två teckningarna som jag var för att göra: teckningen av pytonormen utifrån. Then as I had never drawn sheep pulled I up for him the-second of the two drawings which I was able-to make: the-drawing of the-python from-outside. I recalled that there was a sentence something like this near the beginning of the story: it all made sense. How does it work? I've been reading deep learning theory, and it's tempting to conceptualise it in terms of strengthening of neural pathways. I see a word I don't know, and I think of some words it could be: aðra to a Swedish-speaker first looks like ådra, "vein", and you only later think of andra, "second". This word occurs quite often. "Vein" never makes any sense, but "second" often makes good sense. So the pathway for ådra never gets strengthened but the one for andra does, and after a while my eyes just start seeing it as andra. The same thing happened with numerous other words. As I'm sure many language geeks will attest, it is such a weird and interesting feeling to find the sense emerging from words which initially looked like gibberish! I'm sorry if I've gone into too much detail here, but I wanted to explain what I mean when I say it's like doing drugs. You actually feel the text changing your state of consciousness. I have been making efforts to understand in more quantitative terms what I've been doing here. First, I thought it would be a good exercise to try copying out the text of Litli prinsinn: this would force me to look carefully at every letter, and also give me a machine-readable version that I could analyse. I'm now about three-quarters of the way through (he has just said goodbye to the fox). I tried running my incomplete corpus, which contains about ten thousand words, through a script that Not and I developed last year. All of these 50 words (to be exact, some of them are punctuation marks) are now very familiar to me, and as you can see they make up more than 50% of the text. I tried walking down the list to see when I stopped feeling confident. I can go as far as words with four or five occurrences, and I think I know what nearly all of them mean; that brings me up to about 400 words, and 75% of the total. When I look at words occurring two or three times, I start to feel uncertain, but I still think I know the majority of them. That gets me to 900 words and 86%. The 1600 words which only occur once are of course the hardest; but even here I feel I can guess a lot, perhaps a third to a half of them. Copying out the text has sharpened my understanding of the grammar a good deal, and now I recognise quite a few endings. Though I'm still pretty hazy about the nouns. With multiple genders, multiple cases and marking for definiteness, there are many combinations, and I only know the most common ones. I have finished copying out the text of Litli prins; the file now contains about 14,200 words and about 3,050 unique words. I made a small improvement to our script, so that it now creates an alphabetical index as well. This is very useful for finding copying errors: if I see two words close together which are almost the same, that often means that one of them is an error. Tidying up my copied text is not as tedious as I thought it would be. It's forcing me to look very carefully at everything and consolidate my extremely sketchy vocabulary. I am sure there are still many errors left, but after this initial cleaning up pass I can look at my alphabetical index and get further on trying to understand the grammar. Here's a section showing forms of the word stjarna, "star", which occurs often in Litli prins. I see that occurrences of stjörnu usually come after a preposition. 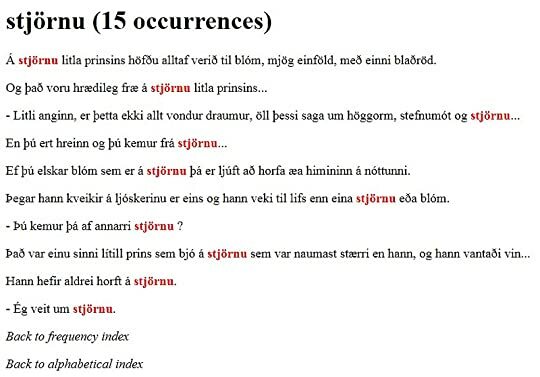 For example, we have Hann hefir aldrei horft á stjörnu, "He has never looked at stjörnu", or En þú ert hreinn og þú kemur frá stjörnu, "But you are pure and you come from stjörnu". Most of the others are similar. Hm, looks like this is a dative singular? My suspicions are reinforced by the fact that Swedish used to have a dative; it disappeared long ago, but still survives in a couple of fixed expressions like till salu, "for sale", which has this -u ending. Á þriðja hnettinum bjó drykkjumaður. Heimsóknin þangað var mjög stutt, en hún fyllti litla prinsinn miklu þunglyndi. Black words like hnettinum ("planet", I think in the dative) and mjög ("very") are quite familiar, and I am reasonably confident that I've guessed the green and blue ones correctly. Only two words, stutt ("short"?) and þunglyndi ("depression"?) are in red, and these are indeed the ones I feel least certain about. I'm pretty much guessing stutt from context. I'm more confident about þunglyndi, since I know from other examples that þung, cognate to Swedish tung, is "heavy", lyndi is probably something related to Swedish lynne, "spirit", and there is a Swedish word tungsint, "heavy-spirited/depressed". I plan to read The Little Prince since many time ago, and I was aware that it was a quick reading, but still I hadn’t do it yet, until now. I went to the cinema theaters and I watched the new animated film about it, and while I hadn’t read the book, I watched the film and I loved it. I was aware that it wasn’t an exact adaptation per se, and then I knew th Beautiful reading! I went to the cinema theaters and I watched the new animated film about it, and while I hadn’t read the book, I watched the film and I loved it. I was aware that it wasn’t an exact adaptation per se, and then I knew that it was about time to read the book. It was a quick reading, it took me like a couple of hours. Wonderful book. And then, and only then you will be able to realice the power behind of this cute little book. Also, a hidden wonder about this book is that you not only need to realice what things in your own life to interchange with the ones in the Little Prince’s journey, but moreover, you need to “see” with your heart and being able to find the “well” in every “desert”. Sometimes isn’t easy, and I guess that there will be moments when those deserts are truly dry, maybe there was a well some time ago, but it’s long gone. But only you, if you are careful and “observant” with your heart, you will be able to make the difference. At plain sight, your eyes can deceive you about what it’s in front of you, but if you learn to “watch” with your heart, rarely you will be fooled about it. *De niño: una historia entrañable sobre un príncipe que busca conocer el mundo. *De adolescente: una historia sobre el crecimiento y lo que denota ser adulto. Se trata, quizá, de una advertencia. یاد آن روزها که بلندترین ساختمان شهر، سیلوی گندم بود بخیر، آن روز ها، عصر که میشد میرفتم در حیاط خانه و جایی پشت بوته گل رز پنهان میشدم، آن وقت به انتظار گربه های ی بخت برگشته مینشتم. سر و کله یکی شان که پیدا میشد، با لنگه کفش کهنه به سوی ش نشانه میرفتم و سپس پرتابی بی نهایت جانانه. با تمام این اوصاف چابکی گربه از دقت نشانه گیری من افزون بود و تیر هرگز به هدف اصابت نمیکرد. جز یکبار که کفش کهنه به کمر گربه نگون بخت برخورد کرد و گربه فریادی از سر درد و غافلگیر ی برآورد. آن روز اولین باری بود که خود را یک فاتح یافتم. بزرگتر که شدم آزار گربه ها ارزشش را برآیم از دست داد. ظهر ها که در خانه تنها بودم چسب مایع را برمیداشتم و میرفتم سر وقت لانه مورچه ها، آن وقت یک دایره بزرگ چسب مایع اطراف لانه مورچه ها میکشید م و به تماشا ی محاصره ارتش سیاهشان مینشتم، لحظات ی بعد چسب را با کبریت آتش میزدم و به نظاره ی خط آتشی که دایره چسب مایع را میپیمود مشغول میشدم، آن وقت حشره کش را روی آتش اسپری میکردم، در یک آن کره اثیری آتش شکل میگرفت و ارتش مورچه ها به ناگاه به ذرات دوده سیاه تبدیل میشد و به بالا عروج میکرد. تا لحظاتی غرق در لذت بی انتها یی میشدم و برق غرور را در چشمانم احساس میکردم. "My life's very monotonous," he said. "I hunt chickens; men hunt me. But if you tame me, it'll be as if the sun came to shine on my life. I shall know the sound of a step that'll be different from all the others. 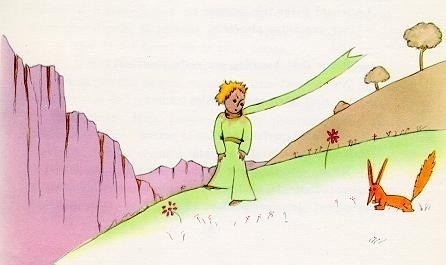 And I shall love to listen to the wind in the wheat…"
The Little Prince is the one book of my childhood that truly wrecked me. Wrecked me, irrevocably. It is the one story that I swore I'd never read again. I didn't. I hadn't. I never read it to my son, either. I did. I watched it. It was a good movie, but, as usual, they added parts, they took away parts, they created The Little Prince is the one book of my childhood that truly wrecked me. Wrecked me, irrevocably. My hands were shaking this weekend, as I cracked the cover to read it, and the first thing I did was read the backflap, where I was reminded that the author himself went missing a year after the book was published in 1943. I immediately pictured Antoine De Saint-Exupery in his little airplane, crashing somewhere, alone, in the Mediterranean Sea. Pretty disturbing, if you know the premise of this fictional story. The tears started early. I don't know what it is about these desert stories, but they wreck me, every time. I have never cried harder than after watching Ralph Fiennes in that red airplane, flying over the desert in The English Patient, or after meeting Claudia, in Moon Tiger, and realizing what she has lost, what she will never find again, in those desert sands. The desert seems to magnify desolation, naturally, by its isolation. It can be a setting for great reflection, great stories, and even greater loss. And, it is here in this desert setting that our crashed pilot meets the little prince, whose life experiences illuminate almost every important lesson we could learn in a lifetime. Of course I was crying again, but in a good way. I could just sit here, adding quote after quote from this book on this review. I could advise all men that everything they need to know about women is available to them in the passages between the little prince and the rose. I could advise all parents of young children that this is one of those rare books that reminds you how precious and fleeting your time is with your kids. I know this is a much loved, much published, children's classic that has been published in pretty much every language there is. As such, I'm not pretentious enough to think my thoughts on it matter, so I'll keep this short. I have challenged myself to read one classic a month this year, and so far, I am failing miserably. MISERABLY, you guys. It's July (almost August, but I'm throwing myself a bone so I feel like less of a loser) and I have only read two. This one and Peter Pan (of which I also completely missed the plot). And yes, I chose both of them because they are short. And geared for children. So I figured they would be easy to read. I finished Alice in Wonderland on December 28th of 2017 (which I ALSO didn't love), after reading it over the course of almost a full month. If only I had really let my loser truly shine and work for me for once and waited three more days to finish it. Then I would at least be three for seven. I'm starting to think children's classics might not be for me. At least not these whimsical, nonsensical, fable/allegory-style classics for which I am obviously too uncouth and unintelligent. Or whatever the case may be. Regardless, I am just finding them to be very boring and I just can't get into them. I'm gonna try Dorian Gray next though. NOT a children's classic. So hopefully I have more luck. Written as a children's book, I find myself unable to pin down firmly as to what makes The Little Prince such a universally likeable book, be it children or grown-ups. What makes it the Hotel California of literature? Is it because most grown-ups secretly love being treated like kids? I think as a grown-up you ought to know better than that. Grown-ups like to be petted around now and then in jest, but that's the end of it. Often, when grown-ups are indeed treated like kids and they're not in the Written as a children's book, I find myself unable to pin down firmly as to what makes The Little Prince such a universally likeable book, be it children or grown-ups. What makes it the Hotel California of literature? Is it because most grown-ups secretly love being treated like kids? I think as a grown-up you ought to know better than that. Grown-ups like to be petted around now and then in jest, but that's the end of it. Often, when grown-ups are indeed treated like kids and they're not in the mood, there is a tiny matchstick inside each one of them, an insecure ego which flares up angrily like it has been wildly struck against a matchbox. In my experience, grown ups like to be taken very seriously. Very very seriously. Is it the clear, simple language? No, it can't be just that. There have been books that have been written with clarity and have been criticized by pedants and pontificating bores for their simplicity. Grown ups like to feel wise and learned by having claimed to read complicated texts that engaged them at an 'intellectual' level. They don't like important things being pointed out to them in simple language, after all they're the know-it-all grown-ups and don't need anybody patronizing them. Is it because the book is so short and grown-ups are always keen on finishing books real quick? No, it can't be just that either. I know grown-ups who believe that a good book, like a well-mixed drink, must be held between the fingers and tended to lovingly at length to let it get to your head. Is it the timeless lessons that the book cushions behind layers of delightful story-telling? Is it the sense of wonder that the book inspires in the most cynical, world-weary adult, if not for posterity then for a day or an hour? I don't know, could be, could be. Worthy contenders they are, but I think I'm not still not home. If I had to lay a bet on it, I'd say everyone adores The Little Prince because we are tired of meeting people from Earth everyday who speak the same dry language of numbers and would love to encounter a sunset-loving, wise prince from the room-sized planet of Asteroid B-612 who talks animatedly about butterflies, baobabs and volcanoes to the child inside us that we've buried long ago underneath the grey tomb of grown-up babble. That is exactly how ridiculous critics who despise The Little Prince are. For The Little Prince is that hot fudge sundae garnished with generous toppings of lost innocence, shared loneliness, deliciously recycled perspective and lessons worth repeating to yourself to keep from succumbing to the unsavoury, contagious disease of adulthood. "People have forgotten this truth," the fox said. "But you mustn’t forget it. You become responsible forever for what you’ve tamed." "One only understands the things that one tames,' said the fox. 'Men have no more time to understand anything. They buy things all ready made at the shops. But there is no shop anywhere where one can buy friendship, and so men have no friends any more. If you want a friend, tame me." I have read only three books which I felt were magical: One Hundred Years of Solitude, To Kill a Mockingbird and this one. However, what separates this from the other two is that this is a book for all ages. There was a magazine called "Imprint" (now defunct) during my childhood, in India. It used to publish literary articles and stories. My father got official copies and he brought them home regularly. One issue contained this story, and he gave it to me for reading. I was maybe 10-12 at that ti I have read only three books which I felt were magical: One Hundred Years of Solitude, To Kill a Mockingbird and this one. However, what separates this from the other two is that this is a book for all ages. There was a magazine called "Imprint" (now defunct) during my childhood, in India. It used to publish literary articles and stories. My father got official copies and he brought them home regularly. One issue contained this story, and he gave it to me for reading. I was maybe 10-12 at that time. It left an indelible impression on my mind: I was sad for the little prince and his proud rose, and constantly worried whether the goat would eat it. I chuckled at the silly grownups on the various planets, following their inane pursuits. I was sad when the fox and the prince had to separate, after he had tamed it. And I broke down and cried at the end. I read this book again after a long time... and suddenly realised that I had become one of those adults on the asteroids. I was still sad after reading it-but now the sorrow had a deeper meaning. It was the death of childhood that I was reading about. This book is an absolute treasure. Illustrazione originale di Antoine de Saint-Exupéry. كتاب لذيذ، شهي، عذب، لامسني في أعمق شغافي، في طفولتي. فتنني وعشقته، يندرُ أن أقبّل كتبي - إذ يجب التحفظ قليلا مع هذه الكائنات - ولكنني قبلتُ هذا الأمير الصغير، وردته ونجمته وبراكينه الخامدة، قبلته في قلبه. 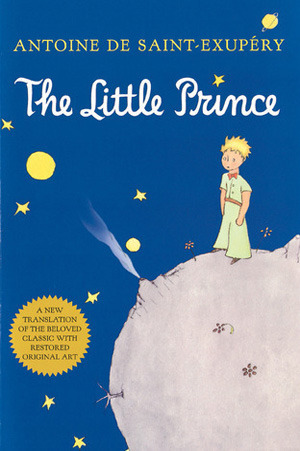 The Little Prince (French: Le Petit Prince), first published in 1943, is a novella, the most famous work of French aristocrat, writer, poet, and pioneering aviator Antoine de Saint-Exupéry. The novella is one of the most-translated books in the world and was voted the best book of the 20th century in France. Translated into 300 languages and dialects, selling nearly two million copies annually, and with year-to-date sales of over 140 million copies worldwide, it has become one of the best-selling books ever published. Debo reconocer con orgullo que recién termino de leer a mis 43 años este libro maravilloso y he recorrido sus páginas con los ojos de un niño y no como parte del mundo de los grandes. La visita del Principito a los distintos planetas me recordó a la que realiza Dante en el Purgatorio, enfrentándose todos los vicios y defectos que tenemos los "adultos". 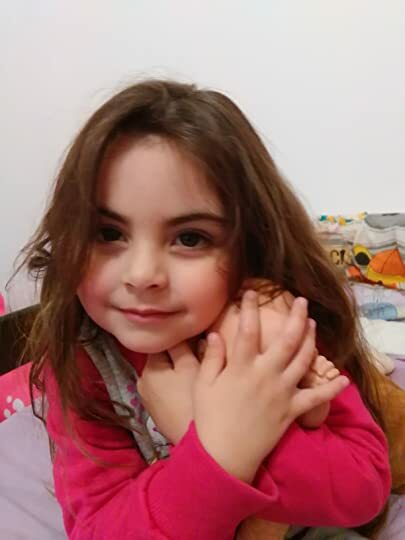 Hoy dormiré pensando en esa rosa que atesoro y que es Martina, mi hija. Lo esencial es (y no es) invisible a los ojos. Pero qué cosa tan más hermosa. Tengo un vago recuerdo de haberlo leído cuando estaba pequeña, pero ni de cerca me impactó como me ha impactado ahora. In a grimy underground locked public toilet The Little Prince wakes slowly, he’s been out cold for hours. He’s bleeding from a gash on his upper arm. He finds he is chained by leg irons to the wall. There is another person sharing his predicament. It’s a bear, also chained to the opposite wall. In the center of the floor is the corpse of what appears to be donkey in a pool of blood. Near the corpse are a gun, a tape recorder and a saw. “Grownups are very strange,” said the Little Prince to himse In a grimy underground locked public toilet The Little Prince wakes slowly, he’s been out cold for hours. He’s bleeding from a gash on his upper arm. He finds he is chained by leg irons to the wall. There is another person sharing his predicament. It’s a bear, also chained to the opposite wall. In the center of the floor is the corpse of what appears to be donkey in a pool of blood. Near the corpse are a gun, a tape recorder and a saw. “Grownups are very strange,” said the Little Prince to himself, sadly. not sure if i can write extensively on this book. it's just so lovely and wonderful, and it really seems like one of those books that reveals another facet with every reading.